U.S. bicycling deaths have increased for the first time in more than 40 years, reports Governing Magazine. Seven hundred twenty-two American bicyclists died in 2012, 56 of them Texans. Only California and Florida reported more deaths. And it’s not just adults who are dying from cycling accidents. Boys 20 years and younger make up 14 percent of the fatalities, according to the Governors Highway Safety Association (GHSA). Many of these deaths may have been avoidable ― the GHSA reports 65 percent of bicyclists killed were not wearing a helmet. Bicycling can be a great way for children (and adults) to get the exercise they need, and TMA encourages kids to be safe while bicycling. Since 1994, TMA’s Hard Hats for Little Heads helmet giveaway program has donated nearly 200,000 helmets to Texas children. 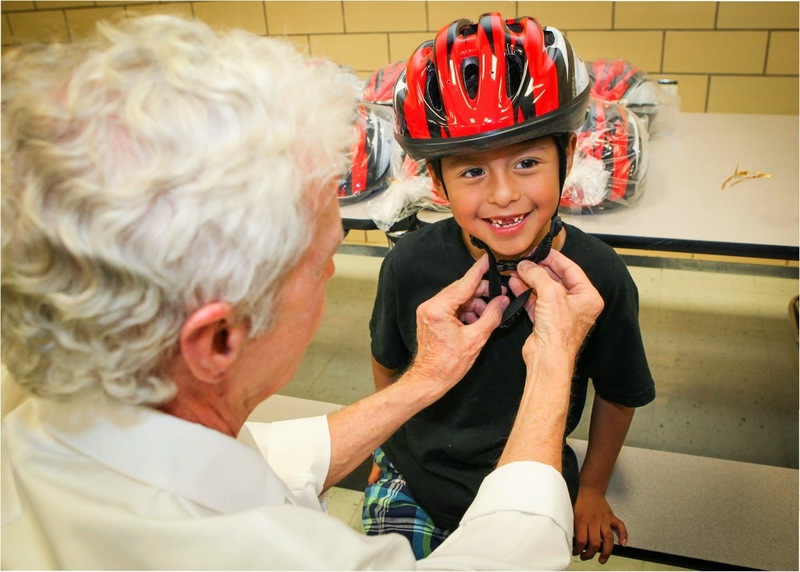 Texas physician Charles Barker, MD, fits a helmet on a boy during a Hard Hats for Little Heads event this month.